If you read my review of WWE 2K18 here on The Gamers' Temple, you'll know that I was greatly disappointed in the game from its lack of content and voice acting, but I felt that it had potential to be better. Thankfully, developers Yukes and Visual Concepts read through many of the poor reviews of 2K18 and addressed many of them in WWE 2K19. 2K19 gives me the impression that there was more of a love for the sport put into the game and the game has far more interesting single player content. The gameplay to WWE 2K19 remains primarily the same as last year. Reversals seem to have a bit more of a window of opportunity for pressing the reversal button to get the upper hand on your opponent, but their window is still overall tight. Thankfully the game still has sliders that allow you to adjust the timing for reversals, but it's still only available for certain modes (not for My Career). There is a new Payback move for all wrestlers that allows you to get extra attributes or additional help later in a match by pressing certain buttons. One payback allows you to reverse moves by simply holding a button, another gives you one extra finisher, one allows you to stand up instantly from a knockdown, etc. Paybacks can be equipped to created characters and each superstar carries their own Paybacks. When first turning on the game, I was already getting into it from the lovely menu design. It's strange to be so positive on menu design, but WWE 2K18 only had a boring list menu with a 3D image of two wrestlers in the background. 2K19's main menu has a nice white background (that is easy on the eyes) along with tabs to cycle through that each display randomizing wrestlers with a sort of particle effect coming off of one side of them. This is more of a personal preference, but the soundtrack of licensed music for 2K19 is much more appealing than last year. There is an equal focus on rap and rock music this year. Fall Out Boy's "Champion" song fits the game all too well. The main single player modes this year are Showcase (The Return of Daniel Bryan), My Career, 2K Towers and WWE Universe. 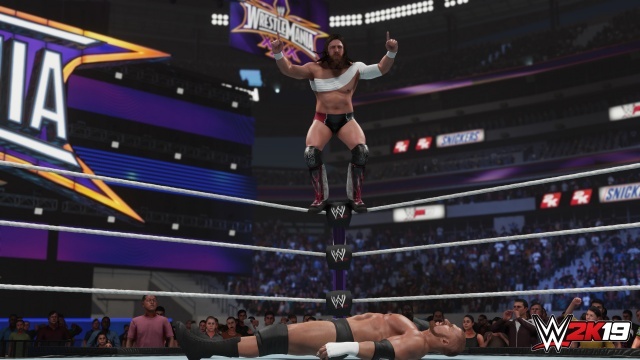 In Showcase, we get to play as the underdog wrestler Daniel Bryan as he tells his tale of success through his years with WWE. This mode has several interviews with the superstar that all lead up to playable iconic wrestling events. You can simply defeat a wrestler and pin the enemy wrestler, or you can try for several optional tasks that appear during each match. One of the most fun parts about Showcase is the wrestler of choice - it's cool to see the tale of an underdog rather than one of the many big time wrestlers in WWE. My Career mode hits all the right pressure points on me in 2K19. Once again, you create a (male) wrestler to play from the start of this mode. My Career features full voice acting for your created wrestler and other characters that interact with him. AJ Kirsch from WWE's Tough Enough reality series lends his voice talent and motion capture to the main character and truly brings your created character to life. The facial animations and voice are absolutely fantastic for the main character. My Career offers an interesting real world plot of not only drama in the ring, but personal life problems that your character has to deal with to get into the ring and work his way through the ranks. Characters other than the main character can be just as interesting. The dialogue is all very well written. You don't see any of the boring "bro talk" and other nonsense that last year's My Career was full of. Wrestlers that are present in the mode lend their voice to their own characters. My Career has tons of cutscenes that take place in between wrestling events. There is a lot of variety in the wrestling modes such as royal rumbles and matches where special objectives must be achieved. Matches with special objectives have a cinematic flair with the minor cutscenes that unfold during the match. Some side quests events start to become available as you progress further into the story. Career mode also has a My Player skill tree that allows you to unlock extra attributes and moves for your character - the skill tree reminds me a lot of the Final Fantasy X's sphere grid where we had to unlock many attribute bonuses on our way to more important items (wrestling moves). Leveling up your created character will give you style points that can be used to unlock skills. The skill tree has one main tree for all created characters and later on you'll unlock a sub-style tree and an Overcharge tree. Only one sub-style tree can be selected out of three (you must commit to only one and can't change) and the Overcharge tree has attributes that can only be bought with Overcharge points that are unlocked from the other two trees. There is also a Road to Glory mode in My Career for taking your creation online as well. Unlike the free roam that we had in last year's My Career, we are only able to interact with characters through a hub shortly before moving on to the next wrestling event. If the absence of free roam makes everything else as fantastic as it is in 2K19's My Career then I'm all for that loss so I don't even consider the loss of free roam that much of a negative - more like a thought for future games. My Career mode is quite long and this is the first time I have ever felt the need to stick with it for quite a while because the story really drew me in. Let's hope that the developers stick with this type of setup for My Career next year and expand upon what they already have here because THIS is the way that you do a story mode in a wrestling game! The Tower mode offers a series of gauntlet listings where you need to work your way through several wrestlers in a row and try to achieve point total goals while defeating your opponents. This mode has a wide variety of themed gauntlets with varying difficulties per listing. There is one tower mode on the main menu for normal superstars and there is another tower mode in My Career for your created superstar. The tower mode in My Career has daily and weekly challenges that change over time. Towers mode (both versions) are really nice for single player variety. They are much like the Towers from Mortal Kombat X with how you have these super hard towers and towers that change constantly. WWE Universe mode is basically the same as it was last year. You get to manage WWE events and change them however you like - basically, you run the show! Simulate matches or play them yourself. Decide who wins and who loses! Just like last year the Promo events are still just as boring thanks to the lack of voice acting. Promos are so lame when you are treated to silent wrestlers that act out their lines with no sound outside of the crowd. You still pick through dialogue options and must stay consistent in order to build up points through staying on topic and keeping the crowd enthused. If Promos had wrestler voice acting, they would be perfect but without the voice acting, they totally fall flat on being entertaining (unless you add your own voice while reading the lines). The game still has the options for creating a character (male and female) along with options for customizing existing superstars. Community Creations mode is still just as interesting as it was last year. Players can go online and see uploaded creations and download them or upload their own. Purchase points can be used to unlock wrestlers and buy moves. Through My Career, you can pull up a list of loot crates to buy that will get you random moves, boosts, customization gear and other items for an overall cheaper amount - like with most loot crates, they are still annoying when trying to buy a certain item. The loading times in 2K19 are way shorter than they were last year. Loading screens only take an average of about 2-3 seconds on my Xbox One X compared to last year's 8-10 seconds (again, on the Xbox One X). The crowds seem way bigger in 2K19 and the crowd seems a bit more detailed. The extra crowd details make wrestler entrances and victories stand out even more. Whenever wrestlers such as Daniel Bryan interact with the crowd and make them raise their hands, you really do notice how good the crowd is in this game - it's so very immersive! The game runs overall very smooth. It's amazing how many wrestlers that the ring can hold during Royal Rumbles without even the slightest hint of slowdown. WWE 2K19 is a massive improvement over 2K18 in overall content. If you want more single player action and a far better My Career mode in your WWE game then be sure to give this game a try! For the past several years, I've been walking away from WWE games feeling disappointed or indifferent but with 2K19, I finally feel a sense of satisfaction after checking it out. Final Rating: 85% - Having AJ Styles on the cover of a WWE game seems to bring good luck. Please keep using him.